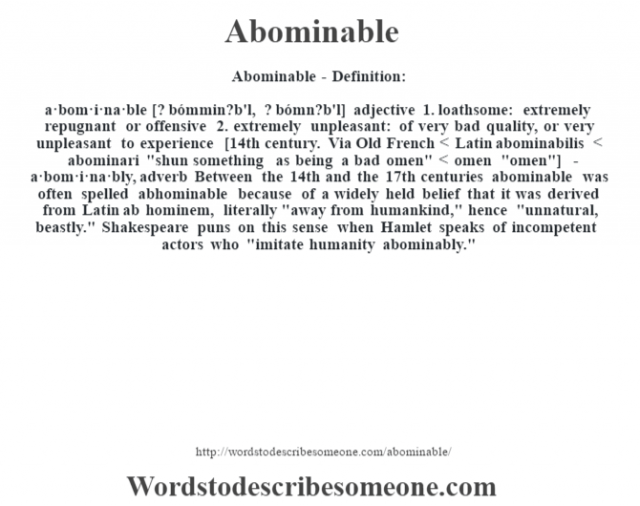 a·bom·i·na·ble [? bómmin?b’l, ? bómn?b’l] adjective 1. loathsome: extremely repugnant or offensive 2. extremely unpleasant: of very bad quality, or very unpleasant to experience [14th century. Via Old French < Latin abominabilis < abominari "shun something as being a bad omen" < omen "omen"] -a·bom·i·na·bly, adverb Between the 14th and the 17th centuries abominable was often spelled abhominable because of a widely held belief that it was derived from Latin ab hominem, literally "away from humankind," hence "unnatural, beastly." Shakespeare puns on this sense when Hamlet speaks of incompetent actors who "imitate humanity abominably."